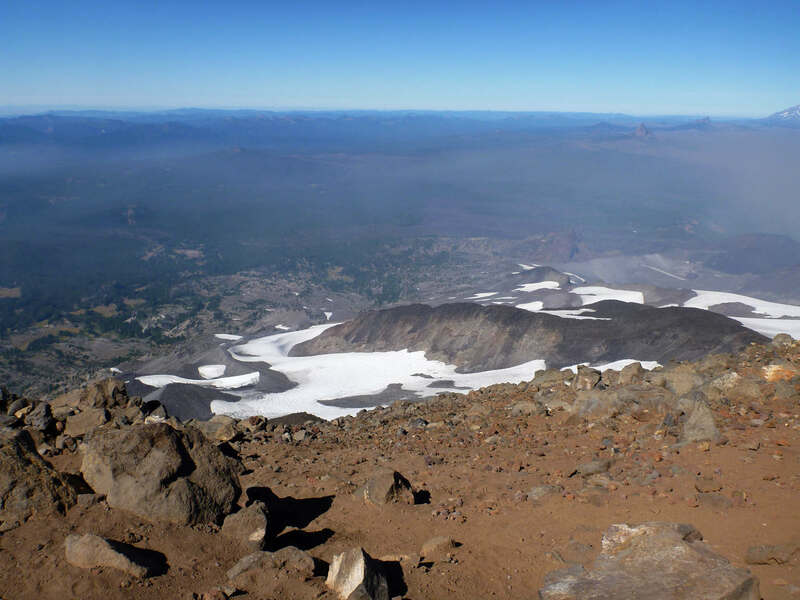 The climb to the summit of Middle Sister was an exercise in managing misinformation about access to the area. I chose a western approach to Renfrew Glacier primarily because the eastern side was blocked by the Pole Creek Fire. 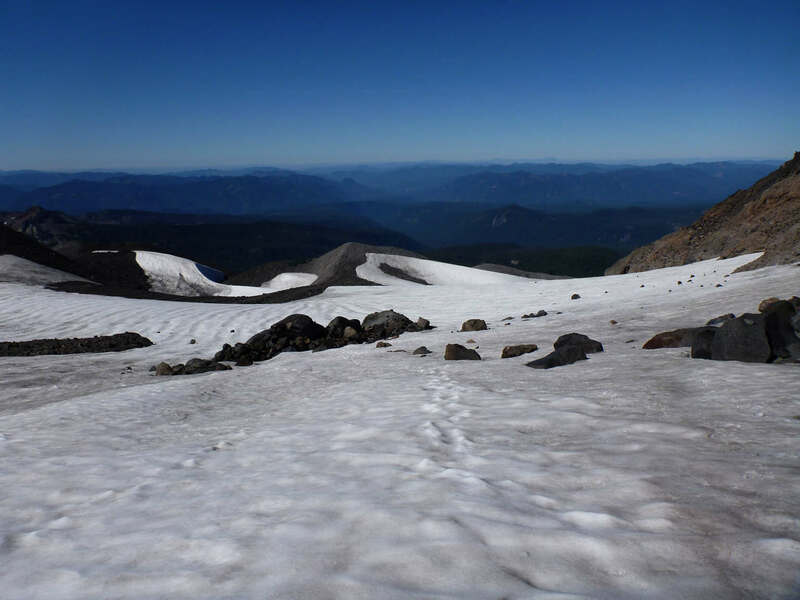 Most printed/online information says a permit is necessary from the Mckenzie Ranger Station. In times past, if approaching from the Sisters side, it only required a call from the Sister's Ranger Station to Mckenzie to issue an Okay. That has all changed. When I arrived at Sisters, I was told that neither the Sisters nor Mckenzie station could issue a permit. "for my convenience" I could go online and, after a credit card payment of $6.00, print out a permit. I'm not in the habit of carrying a printer with me so I asked if I could pay $6.00 to the ranger - No. I asked if the ranger could print out the permit if I entered by credit card number - No. I was told I could print it out at the Sisters Library. The Ranger didn't know that the Sisters Library is closed on Friday and Saturday. But wait, there's more. From various USFS people and hikers I was told that I needed a permit only if I entered via the Obsidian Falls Trail head. 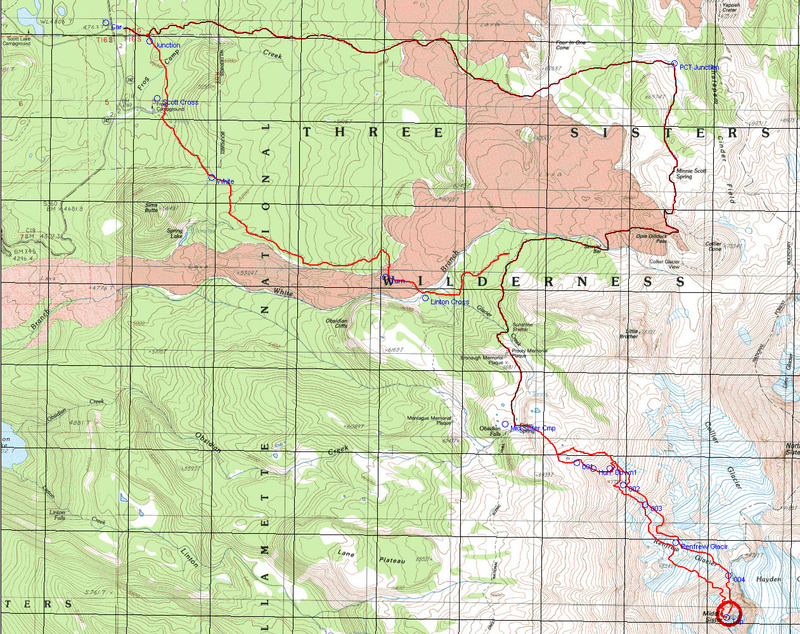 Maybe the spur from the Scott Lake Trail that connects to the Obsidian Trail would be a "Get into Obsidian Area Free" pass. Later I was told it didn't matter how you entered, you needed a permit if you were "in the area". When I asked what the PCT hikers do - the PCT passes through the area - I was told that non-permit hikers must camp on either side of the limited access area. There was no explanation of that on the boundary signs. No one told me I could have continued up the climbers trail to about 7500 ft - the eastern boundary and been "Legal". As it was, I hiked in from Scott Lake to the PCT, then south to Sister Springs. At that point I was going on the "no permit needed if you don't enter via Obsidian Falls trail head" info so I camped on a bluff above the springs. Using a rough ruler and MapTech Maps, that route was over 9 miles long compared 5 miles, the shortest route directly from Obsidian Trail Head. I would have (and tried to) clearly pay $6.00 to cut my approach (with full pack) distance in half. About 8 pm that night I saw headlights along the climbers trail and figured someone was getting an early start. As I was solo, I used The Spot to signal my responsible party where I made camp, when I summited, and when I returned to camp. I started up the next morning, about 8 am, and that was a bit of a mistake. At this time of year, once the sun comes around the mountain, it is shinning right in your eyes the whole day. Note that a "climber's trail" is really a "climber's suggestion" and signs of previous climbers are often subtle shadow marks in the scree. That was all washed out by the bright sunlight. Fortunately, the general direction - up - offered many valid options (though I did have to climb down at least one "bad" ridge). Along the way there was the usual siren call - the beckoning Arrowhead Lake with its meadow like boarder. "Why am I up here when I could be relaxing down by the lake?" But crossing one more scree hill and with Renfrew glacier in sight, I plodded on. When I reached the glacier and was strapping on my crampons, two climbers passed me on their way down. I asked where they spent the night and they replied, "On top." So those were the headlights I saw the previous night - carried their packs all the way up. At this point I want to mention that a comment on SummitPost.org gives proof that there are aliens among us. In the description for Renfrew Glacier ascent, it says the route is 18 miles, car-mountain top-car and it could be done in 12 hours; Scully and Mulder should look into that. Eighteen miles with a mountain in the middle for a normal human; that's a busy day. Once on the snow it was easy going and I soon reached the saddle between Middle and North Sisters. 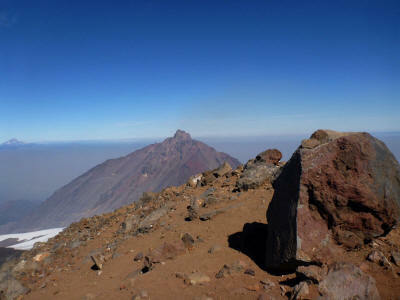 I remembered a visit a few years earlier when people were climbing off the mountain like a parade of ants. Girls in shoestring tops, cut offs and tennis shoes - how difficult could it be from here. Turns out, plenty, if you get off route. Several times I found myself scrambling, hands and feet on the rock. I knew this couldn't be the way the others had climbed it. I saw a couple on the saddle between Middle an North Sisters and even though I was hundreds of feet above them, they soon passed me. Clinging to the rock with both hands, I asked how they did it and they let me know the "climber's trail (suggestion)" was about 10 feet to my right. Okay, I'll do it the easy way. I moved over the the "trail" and life become more relaxing. On the top, I ate a cookie, drank some water and sent an Okay message with The Spot. The couple said the climber's route down was along the west side and again I missed it. So I made my own way down, carefully, in the scree and boulders. Once on the snow, it felt good to put on crampons again - this is terrain I understand. Once off the glacier I was going to pay close attention to whatever trail I could see. With the sun behind me, and some shadows forming, it was easier to follow the trace. But just because the general direction is down, that doesn't mean the climbers track I was following was going to end up "down" at my destination. As it turns out, they were going one ridge over. I caught that before I wasted too much vertical distance but I was getting pretty worn out. The usual hypothermia thoughts appeared - it is so warm (now 3 pm) that I could just put on my down pullover and spend the night up here. Just lay down and take a nap and I'll be fine. I really needed some water (I took two quarts up with me). Miracle that it was, I came across a large pond of snow melt. Though I would have drunken it untreated and suffered any consequences later, I had a new gadget with me. A SteriPen water purifier. I filled a quart Nalgene jar, pushed the button on the pen, inserted in the water and 90 seconds later - pure drinking water. Water this high, and also from the spring at the camp site, is probably pure enough anyway, but why take the chance if you have the option. 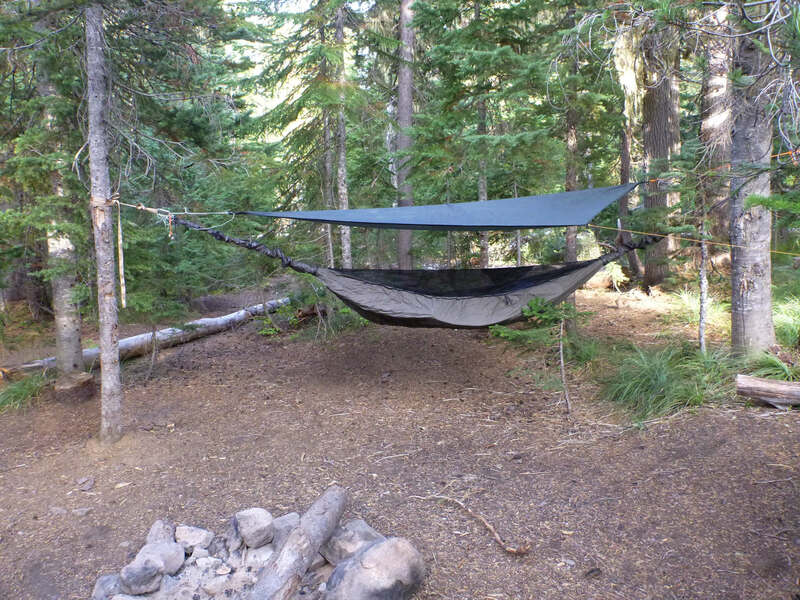 I went to bed early and adjusted the hammock fly so the full moon wouldn't shine in my face - I had enough light in my eyes for the day, thank you. The next day I hiked out via the Glacier Way trail - north of Sister Springs - a spur off the PCT. It looks like it would have been shorter, by about a mile, to continue south, below Obsidian Falls and take that trail out. But those are rough estimates with a distance tool on an electronic map. 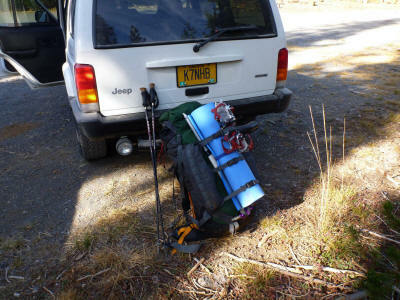 Before I reached the formal Obsidian Trail Head, I took a fork to the right that connected to the Scott Lake Trail. It was another half mile - probably shorter then hiking out from Obsidian T.H. to Hwy 242 - then east, along the road to the car at Scott Lake. I was able to do one good deed. A pair of PCT hikers had been rerouted because of the Pole Creek fire so I took them to the continuation by Dee Wright Observatory. But it might be time for this cowboy to hang up his crampons. 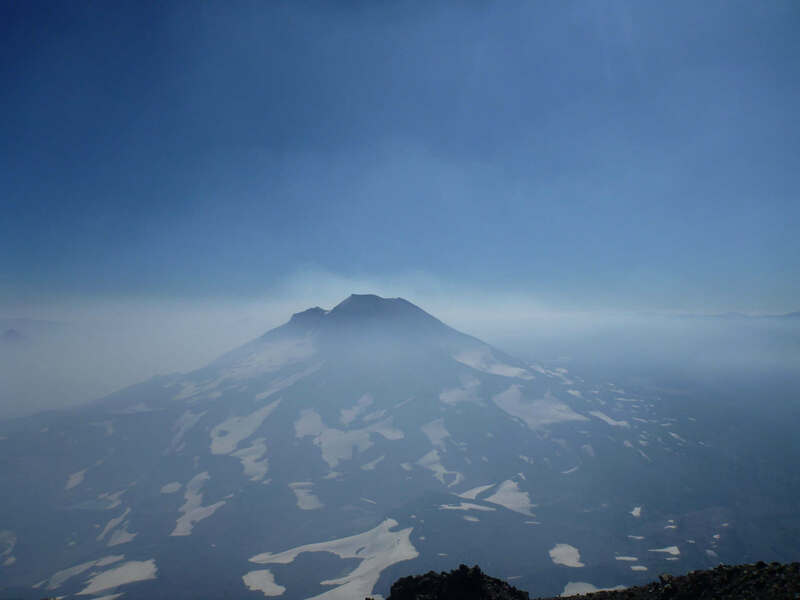 Though I am usually exhausted after a climb, in the past, on the way down I'd be thinking of the next mountain. This time I was thinking how easy car camping is and how I could put four dry bags the size of my backpack in my kayak and paddle off to unexplored shores. On the other hand, the air gets kind of thick below 6000 feet. Four lost in forecast storm on Mt. Rainier-why?